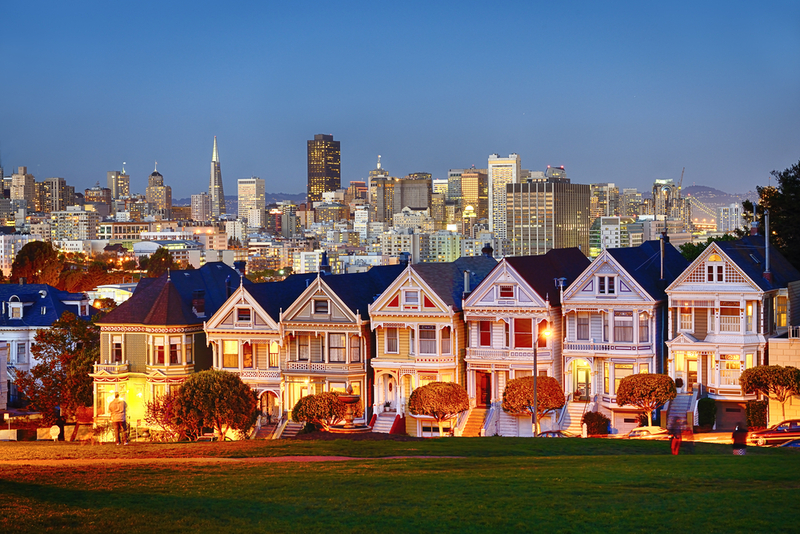 Yvonne Horn investigates what makes San Francisco such a compelling cruise destination. It is one of cruising’s great moments: ahead, the Golden Gate Bridge, its swags of graceful cables framing the sea, an icon as recognisable as the Eiffel Tower and Taj Mahal. Then, the heady moment as your ship passes under thebridge to enter San Francisco Bay. Angel Island starboard, the ominous profile of Alcatraz straight ahead and, port side, the city itself, in a series of high-rises making their way up from the waterfront into the famous hills. Unlike most of the world’s large port cities, ships dock smack in the middle of San Francisco. Disembark at the Cruise Terminal, Pier 35, and you’re within striking distance of all the city has to offer. But, oh dear, the cruise terminal! Pier 35 on the otherwise glorious Embarcadero offers an uninviting, cavernous labyrinth, a dismal gateway to the city. Thankfully, a glorious steel-and-glass building with views in every direction is taking shape on Pier 27 for this September’s America’s Cup event. Next year, it will become San Francisco’s cruise greeting point. 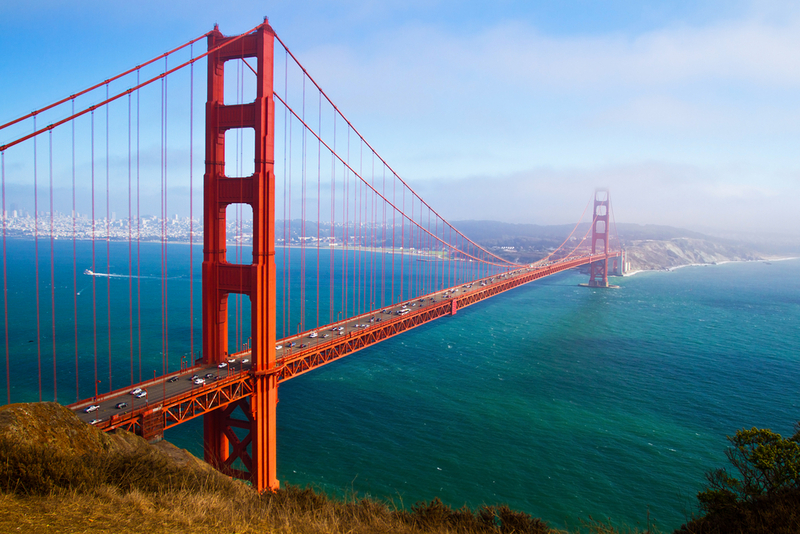 Given your ship’s right-in-San Francisco location, it would be a shame not to linger. Disembarking from a recent cruise, I did just that. A day could easily be spent exploring all the Embarcadero’s palm-lined promenade has to offer. Dotted with attractions, the waterfront promenade is a ‘gift’ of the 1989 Loma Prieta earthquake that, in 15 seconds, pitched buildings from their foundations, sent flames spilling into the sky and buckled freeways. One of the freeways that buckled was an elevated monstrosity that had separated the city from its waterfront. Quickly, San Franciscans had their say: don’t repair it, tear it down. Freed from its concrete burden, the shoreline blossomed. The promenade now stretches 2½-miles from Fisherman’s Wharf to the home of the San Francisco Giants, AT&T Park. The 1898 Ferry Building, with its landmark clock tower modelled after the bell tower in Spain’s Seville Cathedral, is the Embarcadero’s centrepiece. Today, it services some 15,000 ferryriding commuters a day but, more than that, the Ferry Building has become a culinary treasure house, housing dozens of produce purveyors along with restaurants offering fine cuisine. Beginning with the Ferry Building, the Embarcadero offers plentiful opportunities to sample San Francisco’s acclaimed dining creativity. Stroll the promenade and choose from Vietnamese at the Slanted Door; regional flavours with a French style at Boulevard; Peruvian at La Mar; vegetarian at Greens; and celebrity Napa Valley chef Michael Chiarello’s first foray into Spanish-fusion food, Coqueta. I stayed at another earthquake survivor, Hotel Griffon, across from the Ferry Building. A hotel for more than 100 years, the building languished under the freeway. Today it is one of the city’s most stylish boutique hotels. With a Bay-view room, I had to tear myself away from its windows at night when the Bay Bridge, the world’s largest self-anchored suspension bridge, became a dazzling, monumental piece of art thanks to 25,000 individually programmed white LED lights. The hotel’s location made getting around easy, as the F Line’s trolley tracks are steps away from its front door. 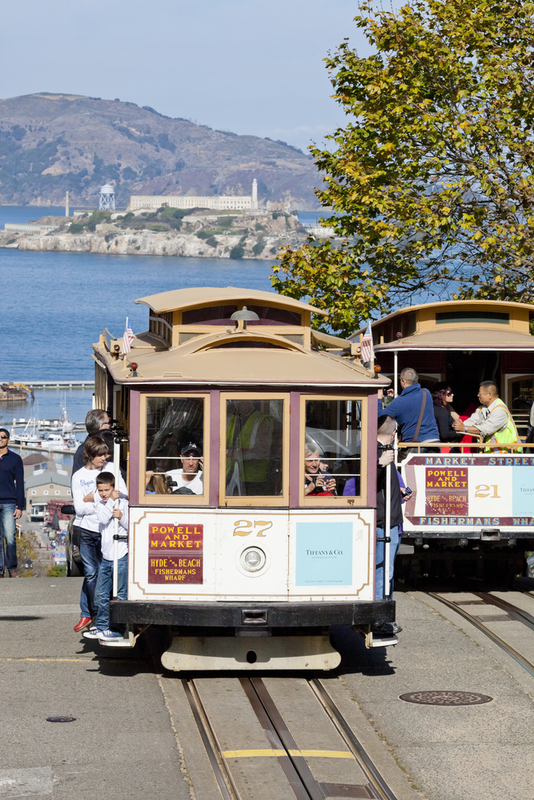 Everyday transportation for San Franciscans, the colourful F Line is perfect for sightseeing. The line consists of vintage trolleys rescued by a dedicated group of streetcar lovers. Lovingly spruced into mint condition, 40 trolleys rotate in service. Begin at the Fisherman’s Wharf terminal. Before hopping on the trolley, I took advantage of a City Guide tour, Fisherman’s Wharf’s hidden history. In its 35th year, the City Guides offer 93 free walking tours of the city, with as many as 12 on any given day. My tour ignored the gimmicky kitsch of Pier 39 – heavily visited by tourists, largely ignored by locals – to visit the Hyde Street Pier’s collection of historic ships; the Buena Vista Café where Irish coffee was introduced to America; the Museé Mecanique, a collection of some 160 antique coin-operated machines; the Dolphin Club, whose members regularly swim the Bay’s frigid water; Alioto-Lazio Fish Company, on the Wharf for more than 70 years, its operation today overseen by an all “girl” team, the founder’s daughters and granddaughters, and more. Leaving the Fisherman’s Wharf terminal, the F Line’s Powell Street stop a few minutes later is where you catch the ferry to Alcatraz, the rock in the Bay where some of the country’s most notorious criminals were incarcerated. At the Greenwich stop, next, walk through park-like Levi’s Plaza to the base of a cliff with garden-edged staircases clinging to its face. At the top is 1933-built Coit Tower with its splendid views and interior murals funded by the government to provide work for artists during the Depression. Continuing on, the Washington Street stop is the gateway to Jackson Square National Historic District. Spared by the 1906 quake, it’s the oldest commercial district, full of antique dealers and art galleries today. Next comes the opportunity to explore the riches beneath the Bay at the Aquarium of the Bay. Coming up is Pier 15, home to the new Exploratorium, an internationally acclaimed museum of science, jam-packed with hands-on exhibits. The café and observation terrace take full advantage of the waterfront. And don’t miss the outdoor sculpture, a harp that changes its tune according to the wind. Jump off the streetcar at the stop just before the Ferry Building to take the back walkway at Piers 1½, 3 and 5 that puts you within sloshing distance of the Bay. At the Ferry Building, the F Line turns to head up Market Street, were the California Street cable-car line terminal beckons. To visit and not ride a cable-car for a cling-clanging, hill-climbing ride would be tantamount to visiting the Louvre and skipping the Mona Lisa. The California Street track offers an un-crowded alternative to the packed Powell Street lines that deliver tourists to Fisherman’s Wharf. During my visit, I used the California line twice. Once, because it delivered me to the gates of Chinatown, the largest settlement of its kind outside Asia, and to Nob Hill, location of four of the city’s most grand hotels. From there, I walked the few blocks downhill into North Beach. Tucked between Chinatown and Fisherman’s Wharf, the city’s Italian enclave is home to the 1950s Beat scene. I climbed the stone steps of Club Fugazi to take in Beach Blanket Babylon. In its 39th year, the show is the longest-running musical review in theatre history. Featuring outrageous humour, great music, irreverent characterisations of the famous and the biggest hair and hats ever seen on stage, BBB has become legendary. returning to the F Line, the stop at Second and Montgomery, puts you in the middle of the Wall Street of the West. Two blocks farther on, the fourth and Stockton stop is convenient to the Union Square area, considered the heart of the city’s upscale shopping. Disembark at Fifth Street to catch the tourist-packed Powell Street cable car lines that deliver you over the hills to Fisherman’s Wharf. here, too, is the enormous Westfield shopping center, choc-abloc with trendy shops and the largest Bloomingdale’s west of New York. Hop off at Ninth and Larkin for a short stroll to the Asian Art Museum, housed in a stunning architectural reconfiguration of the city’s old main library. This stop, or the Van Ness stop coming up, is where to alight for glorious City Hall or a performance at Davies Symphony Hall, the War Memorial Opera House or the newly opened concert hall built specifically for jazz, SFJAZZ. The F Line then dips and climbs to Dolores Street. Walk three palmlined blocks to the historic Mission Dolores, constructed in 1776 and the city’s oldest structure. 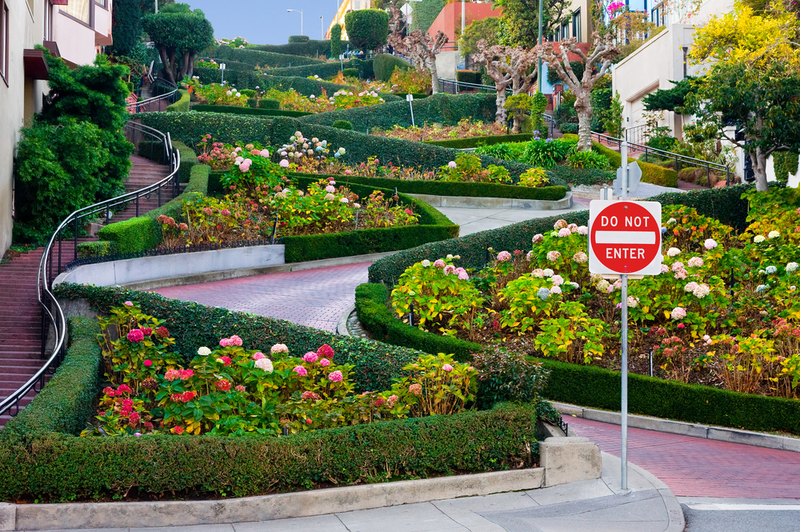 Last stop puts you in the heart of the Castro District, renowned as a symbol of gay freedom but also a vital neighbourhood where people live, work, shop and dine. Wanting to go further afield, I boarded a hop On-hop Off bus, choosing the Golden Gate Park Loop itinerary from the three offered. For an overview of the entire city, you can put all three together. In Golden Gate Park, two aging dowagers have long faced each other over a fountain-centred esplanade – the de Young Museum, the city’s fine arts museum, and the California Academy of Sciences. The de young’s 140ft tower affords a full-circle view of the city so wondrous it puts Coit Tower in second place while the just reopened Academy of Sciences is topped by a living 2.5-acre roof of mounds planted with native California specimens. THE GOLDEN GATE BRIDGE: A pedestrian walkway crosses its 1.7-mile span while bikes, too, are allowed. CABLE CARS: Three routes run on tracks and are moved by an underground cable. Tickets ($5 for a one-way ride) may be purchased at the turnarounds at the end of each route (www.sfcablecar.com). 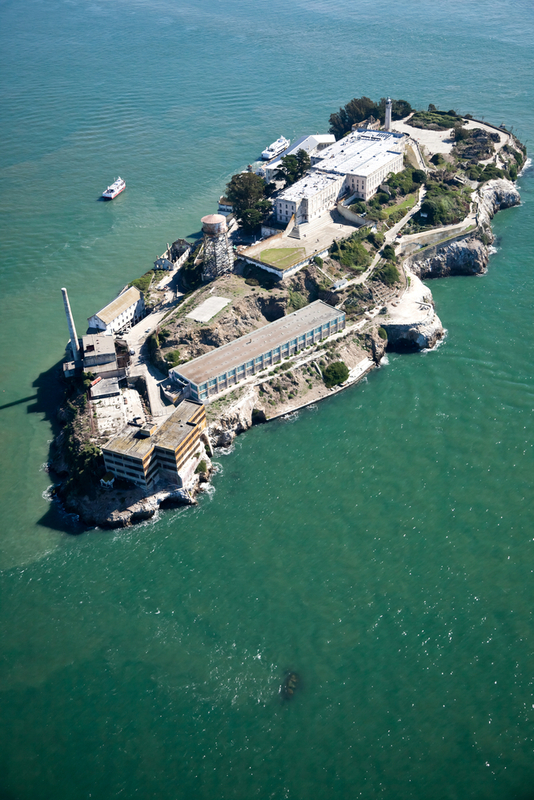 ALCATRAZ: The notorious prison in the middle of the Bay is reached by ferry from Pier 43. reservations are recommended. 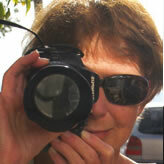 don’t miss the selfguided audio tour (www.alcatrazcruises.com). CITY GUIDE TOURS: up to 12 free walking tours are offered daily, led by volunteers who know and love their assigned areas (www.sfcityguides.org). UNION SQUARE: Major department stores and designer boutiques line the surrounding streets. Buy discounted tickets for the theatre (the city boasts 150) and musical performances at the box office on the east side. NORTH BEACH: The city’s italian quarter is a neighbourhood of European-style sidewalk cafes, restaurants and shops centred near washington square. 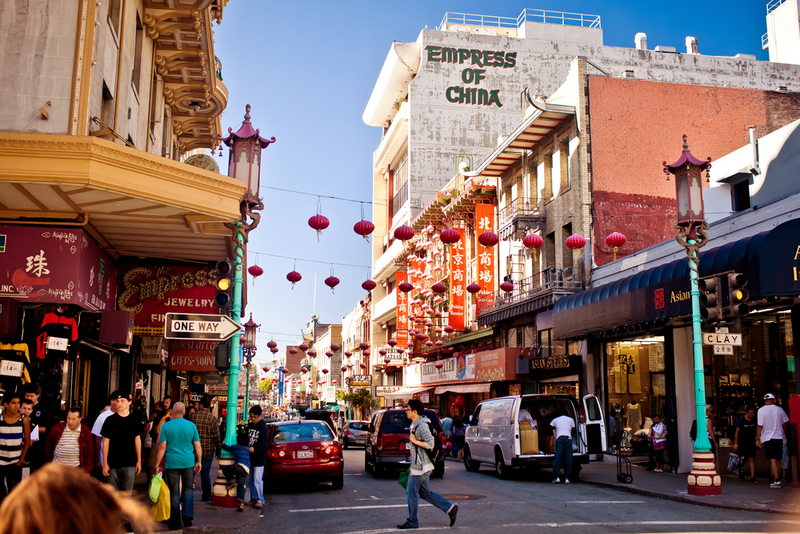 CHINATOWN: Twenty-four blocks and uncounted alleys of hustlebustle are centered on grant Avenue, the city’s oldest street, with exotic shops, markets, temples and restaurants, best explored on foot with a local guide such as wok wiz (www.wokwiz.com). DINING: local chefs excel at combining local fresh ingredients, international flavours and a touch of creative genius. for a complete list, visit www.sanfrancisco.travel/dine. Yvonne Horn, a member of the Society of American Travel Writers and American Society of Journalists, makes her home in northern California’s Sonoma County, when she’s not out exploring the world. On sea, her preference is to step aboard a small ship bound for almost anywhere.